Peak bloom for D.C.'s famed cherry blossoms isn't expected until early April, but Drink Company's third annual Cherry Blossom Pop-Up is already back in business. 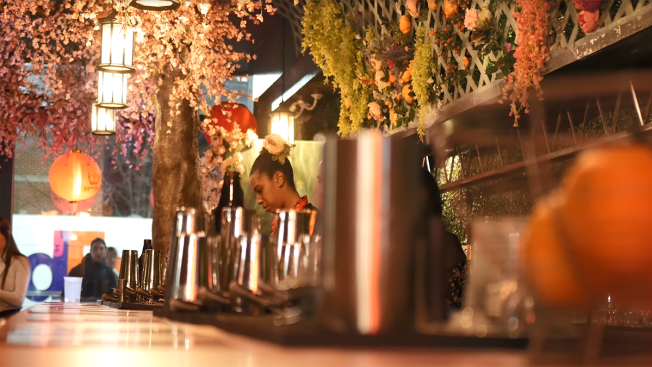 The shape-shifting bar that previously served Christmas, royal wedding and, briefly, "Rick and Morty"-themed drinks, will feature cherry blossom decor, as well as a special ramen-flavored twist to celebrate the festival’s Japanese origins. This year’s ramen room features eight-foot chopsticks dipping in from the ceiling and yellow pool noodles to emulate, well, noodles. There will be ramen to eat as well, from Chef Hiro Mitsui, who runs a ramen stall in Union Market named Uzu, Washingtonian reported. There will also be a photo booth, for those looking to snag the perfect 'gram. The menu will feature a few brand-new cocktails carefully designed by Head of Bar Concepts Paul Taylor. The Once and Floral takes the structure of a gin sour and adds peach and earthy matcha. The Honeydew, Honey See has a mix of sake, shio koji — which is a syrup made from fermented sake grains — and absinthe, cucumberand honeydew melon to create a complex and subtly spicy beverage. The pop-up bar at 1839 7th St. NW is set to be open until April 21.